In cultivation of fruit-bearing trees, thoroughly understanding growth of branches and leaves of individual trees and adequately managing the trees are important in improving their quality. However, daily observation and advanced knowledge are necessary for proper management and cultivation of trees, so tree management systems using cameras have been drawing attention. The automatic 3D modeling of plant shapes and branch structures, from images in particular, is an indispensable technology for pursuing both labor-saving cultivation and improvement of product quality. Three-dimensional (3D) reconstruction from multiple images obtained from different viewpoints has been actively examined. However, it was difficult to reconstruct the structure of objects which have hidden portions, such as plants with branch structures hidden under their leaves. By combining the original image-to-image translation approach in a Bayesian deep learning framework and 3D reconstruction, a group of researchers led by Fumio Okura estimated the existence probability of branches that are hidden under leaves in images obtained. 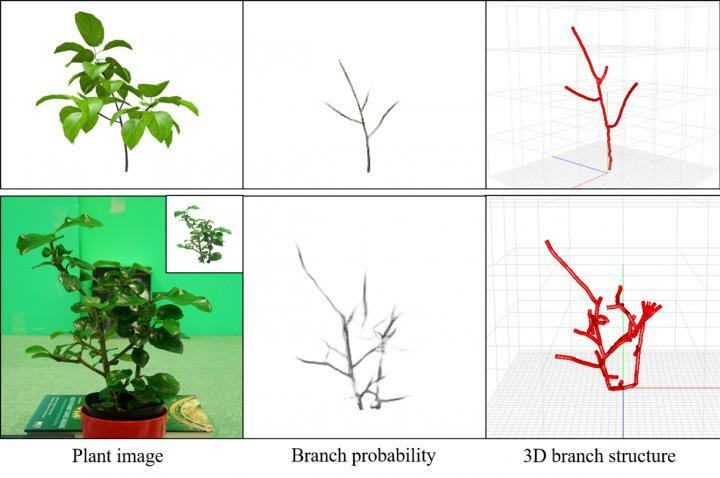 Using these estimated branch positions, they achieved 3D reconstruction of plant structure, i.e., accurate reconstruction of branch structures, including those hidden under leaves. Specifically, they converted images of leafy plants to images showing branch existence probability, thereby achieving 3D reconstruction. The results of this study will be presented at the EEE/CVF Conference on Computer Vision and Pattern Recognition (CVPR 2018) to be held from June 18 through June 22, 2018. The paper presented at the conference will be published in Computer Vision Foundation Open Access as part of the conference proceedings on June 4, 2018. The results will become fundamental technology for cultivation and management of plants by artificial intelligence (AI) and image analysis. They will be greatly helpful in realizing future cultivation technology to allow for (a) detailed daily management of branch/leaf level process of growing plants in places where cultivators' vision can't reach by filming with a drone or robot, (b) coming up with best trimming or pruning methods for plants, and (c) forecasting future growth of plants.